Flash cards are a great educational tool. They can also be turned into fun games for groups or individual. 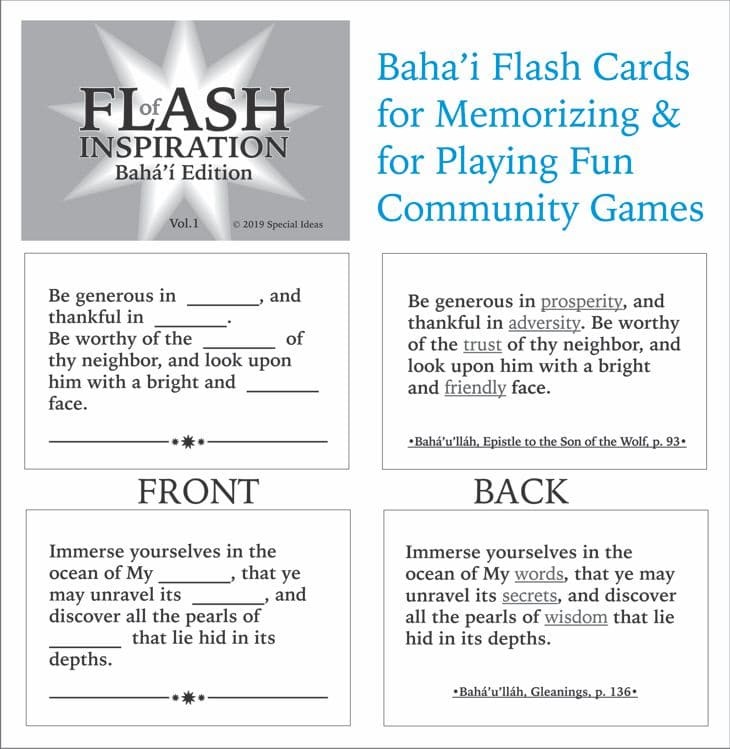 This set of 52 cards has a well-loved Baha’i quotation with several words missing on one side, and the same quotation with those words highlighted on the back. Click here to see all of our games and activities. A few months ago, I put out a call on FaceBook for people to comment with their favorite “one liners” from the Baha’i Writings. Friends from around the world offered dozens and dozens of suggestions. Other friends shared my post, and those shares also received dozens of suggestions. From these, I distilled out 52 short quotations that reflect the core principles of the Faith. Some are prayers, some are exhortations, and some describe the fundamental verities that we might be asked to explain to seekers. We know that we are encouraged to memorize the Writings. But it isn’t always easy. Flash cards turn the process into a game. One side of each card has a complete quotation. The other has key words missing. The words that are there act as a prompt. Trying to recall the words that are missing causes your brain to process the information differently than just reading the complete quote. This makes it easier to memorize everything. The cards come with instructions for different games you can play with them. Click the picture to read about them. We have several other games and activities that teach principles, encourage communication, promote virtues, and bring joy and laughter to gatherings. Above is our Quintessence deck of cards. 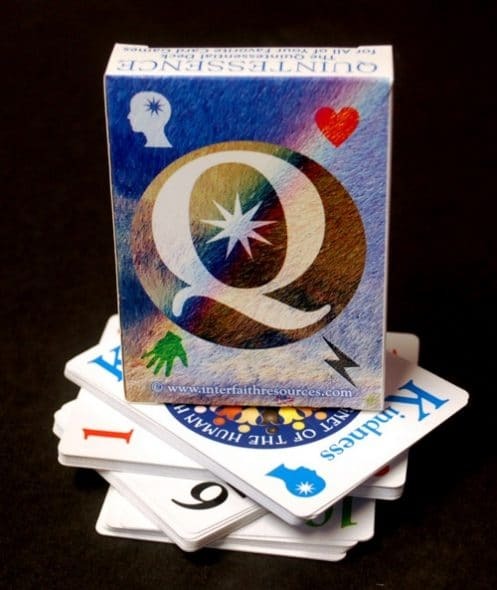 It can be used just like any standard deck, but the names of the suits are Head, Hand, Heart and Will, and each card within the suits presents a different spiritual principle. 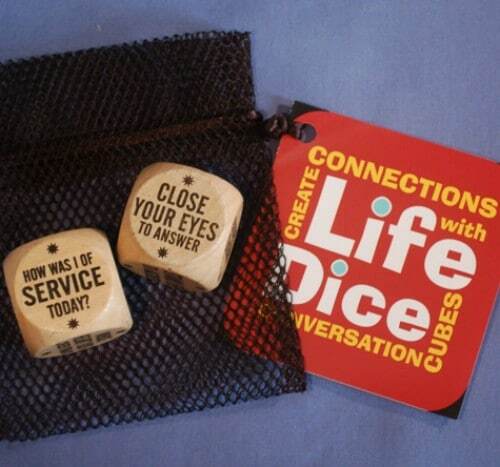 Life Dice gets your dinner conversations rolling. It is a great gift for families with kids, but can also be used as ice breakers at Feast, Firesides and workshops. 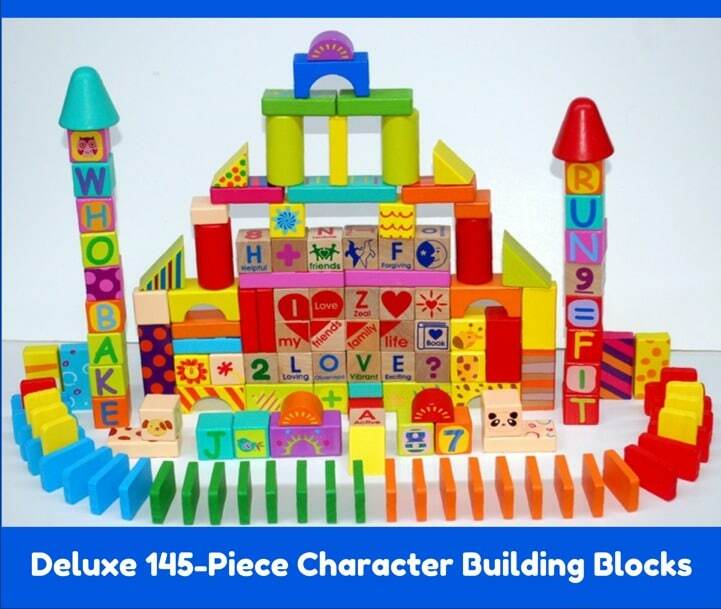 Our Games and Activities Page includes an additional board game, building blocks, coloring books, word puzzle books, and craft activities. By next week, we should have our newest coloring book in: Animals Building Character.